As a biologist and self-confessed thrill seeker, Patrick has always had a fascination with ‘how things work’. His guiding force is to allow his audience to travel the globe from the comfort of their homes and live vicariously through his daringly close animal encounters. His latest series Big Beasts: Last of the Giants, sees Patrick face to face with the biggest animals on Earth; discovering why size really matters in nature, and observing the perfection and execution of the species in their natural habitats. His journey takes him to Asia where he comes face-to-face with the Komodo dragon, right across to the Americas, where he free dives with a gigantic sperm whale weighing in at 15-tonnes. He ultimately explores why these creatures evolved into giants, and how crucial they are to their habitats today. Patrick has a versatile presenting style which has allowed him a host a variety of programmes; from the epic Amazing Animal Family franchise, to the expedition show Yellowstone’s: Wildest Winter, the heart-warming Nature’s Miracle Orphans and the fact filled Super Senses. Patrick’s career in wildlife filmmaking began shortly after graduating with a degree in Molecular & Cellular Biology at the University of Bristol. He worked behind the scenes on the BBC productions Madagascar, Attenborough: 60 years in the Wild and Frozen Planet. Hugely enjoying the creativity of television, Patrick was delighted to be asked to present BBC Earth’s online natural history strand Zoo-La-La, a weekly show about weird and wonderful animal facts that helped launch the BBC Earth YouTube platform, Earth Unplugged. After this, Patrick went from strength to strength. He presented Super Senses a specialist factual show for BBC Two. The series, Patrick’s first TV appearance, explored the extraordinary world of animal senses. In each episode he focused on key themes; sight, sound and scent across five continents, revealing the amazing super senses of the animal world. Seeing his passion and expertise, Sky One commissioned him to host a collection of six natural history programmes. This included Big Cats: An Amazing Animal Family, which went on to win Patrick the RTS West Award for Best Presenter. Big Cats was so successful with children it was also made into exclusive online series Big Cat Wild Files, for Sky Kids. 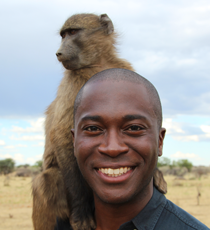 Returning to the BBC, Patrick then co-presented Nature’s Miracle Orphans, Ingenious Animals and Super Small Animals. Continuing his projects at Sky One, Patrick travelled the world filming a two more 4K series, Wild Animal Babies and Big Beasts: Last of the Giants. Patrick is a regular contributor on The One Show, and co-hosted Springwatch 2018.